If you think that working from home is a glamorous endeavor with few distractions, think again. Yes, I can work from my home office in my pajamas. But it’s not easy to stay on schedule when your home life and work life collide. 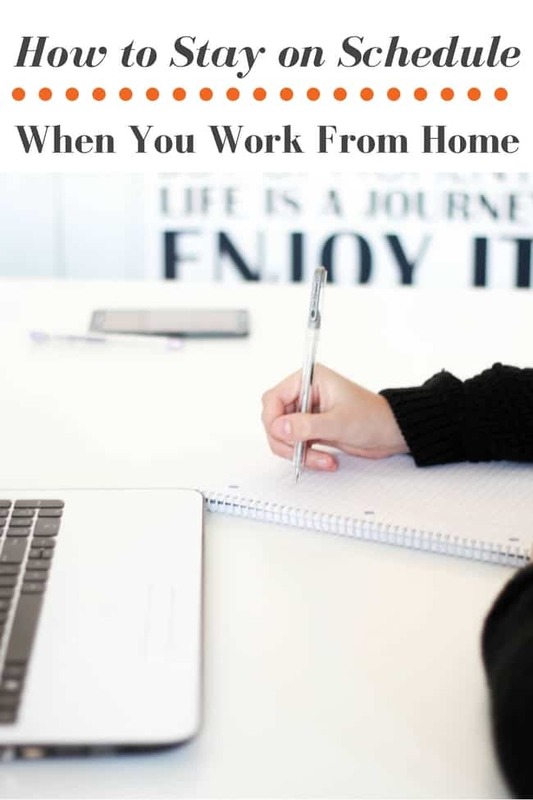 For anyone who has ever tried to maintain a schedule when you work from home, you know that sitting in front of your computer exponentially increases the chance of the doorbell ringing, your long lost relative calling for a chat, or the neighbor who never talks to you calling for a quick favor… because, you know, you are always home. However, there are six things you can do to minimize wasted time, meet deadlines, and still enjoy your home office environment. One of the best ways to stay on schedule is to minimize distractions. If you have a designated home office, consider yourself lucky. You can shut the door, turn on the lights and your laptop, and get to work. If, however, you share your office space with the kitchen or dining room, eliminating distractions can be a bit more challenging. If you work best without a lot of background chatter, put in your earbuds and turn on Noisli or another white noise app that will let you focus and block out the background noise. Also, you have to find the way to nicely communicate with the other adults in your life that you are actually working even though you are at home – you’re not hanging out watching The Walking Dead reruns all day. You can’t get things done or stay on schedule if you don’t know what you’re supposed to be doing. Keep a calendar easily accessible so that you can reference it no matter where you are. Google Calendar is a great option for an online calendar because you can sync it with your mobile devices and your desktop computer. A daily planner or journal is also ideal to keep on hand for day to day notes, to-do lists, and more. The more detailed you are about what needs to be done, the more likely you are to stay on schedule and meet deadlines. For those who have a robust list of projects and deadlines, we love Asana around here and use it to manage all of our website work and client marketing work. Working from home can be problematic because there isn’t the typical office day flow. Time Blocking can help you stay on schedule and increase productivity. Start by analyzing the tasks that you need to complete for the day and group like tasks together. For instance, if you’re scheduling posts, block off a section of time and chunk that work together. You become much more efficient at getting tasks done when you bundle them in ways that make sense. Be sure to schedule in mini-breaks between those chunks of time, as taking even a five-minute break can greatly increase your motivation and improve your productivity. Nothing can motivate you to stay on schedule and get tasks done like a timer. Try the entrepreneur’s version of “Beat the Clock” by challenging yourself to complete tasks within a certain amount of time. Need to get some writing done? Set your timer and concentrate solely on the task at hand. When the timer goes off, if you’re not done, re-set it for two or three more minutes. This will motivate you to keep going, keep focused, and accomplish what you need to do. More productivity is killed by Facebook surfing and other social media notifications than anything else. 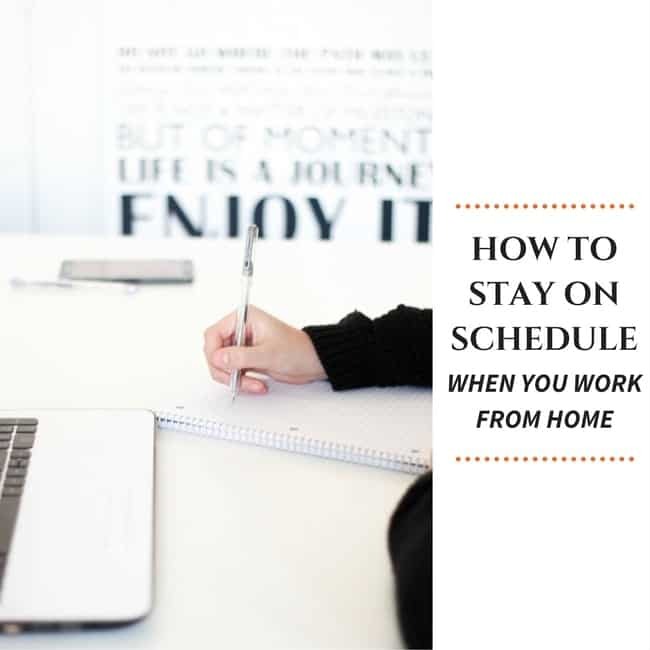 To stay on schedule, especially when you work from home, turn off all social media notifications and refuse to open the websites if you are on a deadline. If your business revolves around social media, try using a scheduler (a person or an app!) that will allow you to focus on business tasks instead of showing you what your friends and family are posting. It’s easier to get things done when you’re focused and social media is not conducive to concentration. There is perhaps nothing more frustrating than misplacing something in your own office. And when you work from home, there is always the possibility that your home office escaped into the rest of the house. Learn to Organize Your Home Office and get your current chaos under control. Just setting up your home office? Find out what every home office needs. Staying on schedule when you work from home requires planning and commitment. By limiting distractions, keeping a calendar and sticking to the tasks at hand, you’ll be able to increase your productivity. Don’t forget to schedule in breaks though because sometimes you can wind up being your toughest boss.